Staying ahead of the deadline is good. Billing your clients promptly and accurately tells them you're a professional. 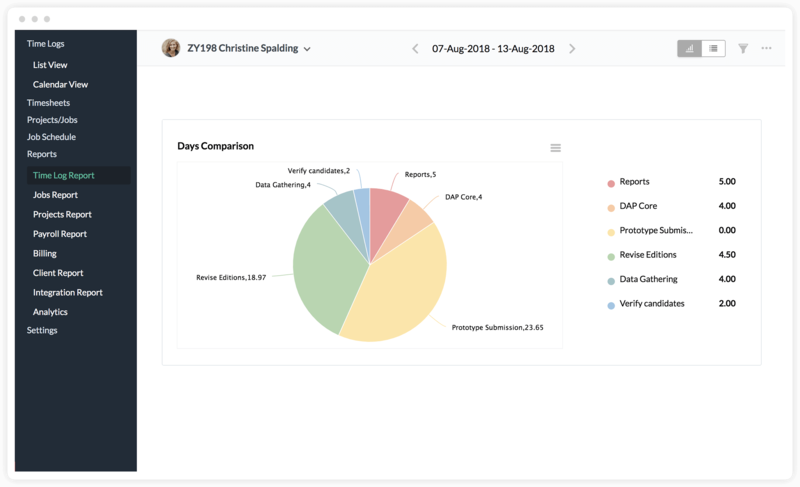 Put your best foot forward with Zoho People by easily logging time for projects, creating timesheets, sending them for approval, billing clients and paying employees. Log time on a daily or weekly basis; the choice is yours. You can also use timers to record hours automatically. And for multiple projects, creating and updating weekly logs is a snap in Zoho People. Adding clients and projects to the system is a breeze. Just define the jobs for each project, assign them, and record the time worked for each job. An effective way to coordinate jobs and easily track progress. You can schedule multiple jobs for a single day, or the entire week, and even repeat postings at regular intervals for recurring positions. Detailed reports provide a clear picture of scheduled hours, logged hours, and any deviations. Bypass manual entry with our Time Tracker. Because People is integrated with Zoho CRM, it's easy to associate a job with a CRM client or account without any extra work. A single click also lets you see a summary of the time billed to any client. 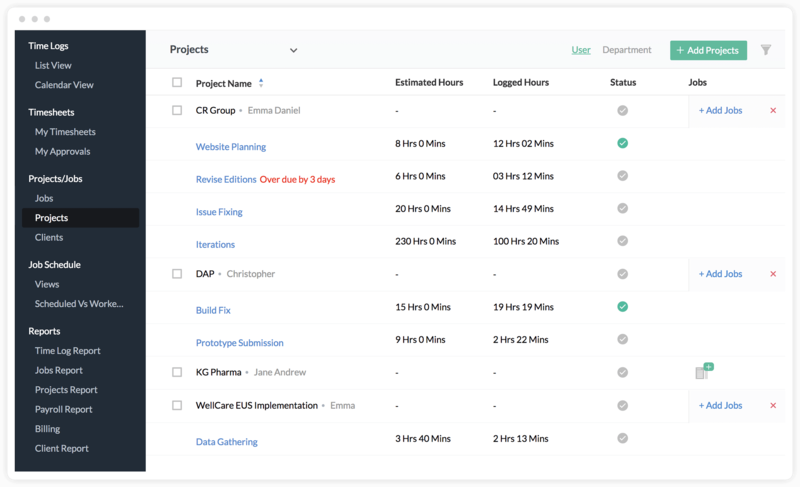 You can now generate timesheets for every project worked and bill clients accurately. Set up a timesheet approval process and be sure that reporting heads are greenlighting the right jobs before billing clients. 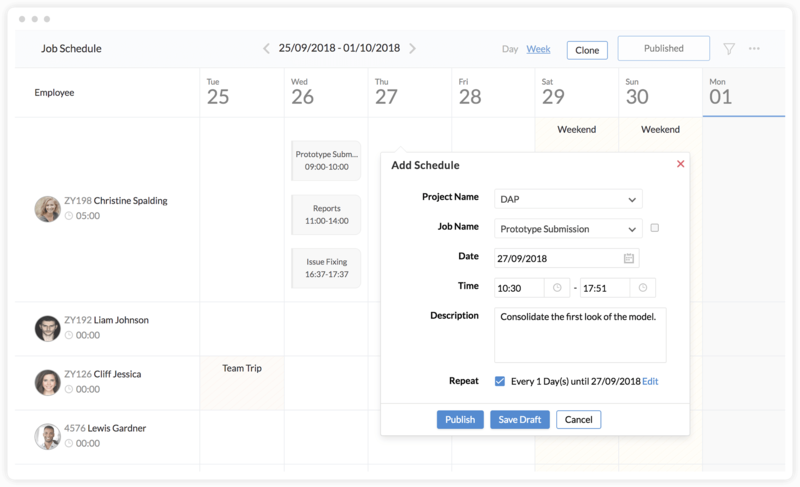 Use a scheduler to have employees submit their hours, and leave the rest to Zoho People. Zoho People's periodic time logs—whether daily, weekly, or monthly—allow staff to record their work hours. Maintaining time cards is now easier thanks to the link between the time tracker and the Attendance module. The scheduler reminds employees to send in their time logs, and documents them automatically at set intervals. A lot of the work of business is keeping track of the little things. When you have multiple jobs in progress simultaneously, attention to detail becomes all the more important. Get fine-grained job reports so you can track progress and be sure to deliver the results on time. 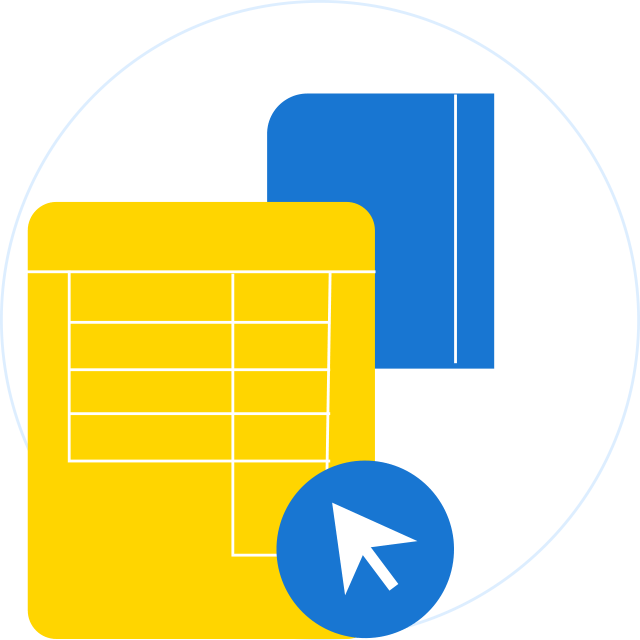 Generating invoices is simple with Zoho People. 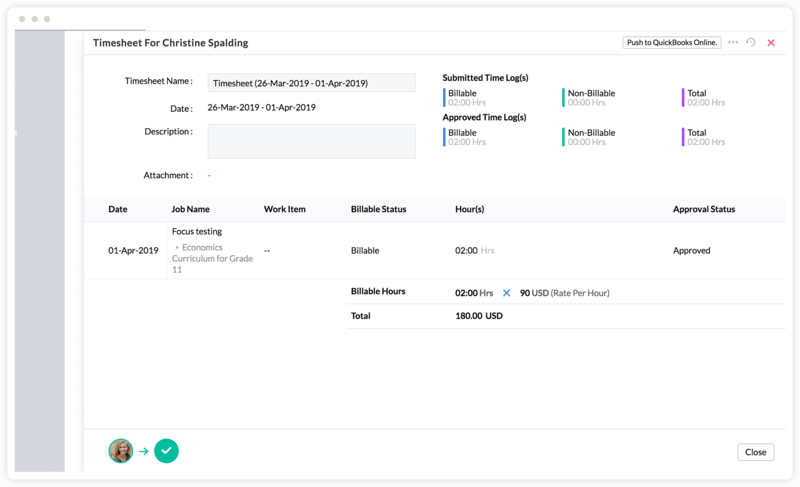 We're integrated with Zoho Books, Zoho Invoice, and QuickBooks, so just push your completed timesheets into your favorite invoicing software and start getting paid!